Capsule Endoscopy is used as an adjunct to study small bowel pathology. Non excretion of the capsule has been reported in Crohn’s disease and strictures. Enteroscopy or surgical intervention is needed when the capsule is retained. I report a case where adhesions prevented excretion of the capsule. It was retrieved with Laparoscopy. A 65 yr old with prior hysterectomy underwent capsule endoscopy for iron deficiency anemia. The capsule did not progress after 3 hours of study. Enteroscopy was attempted at 6 weeks but scope could not be advanced as the bowel was dilated. CT scan confirmed the device in the small bowel. Laparoscopy was performed with 3 ports (12mm and 5mm x2). An adhesion from the anterior abdominal wall to the small bowel mesentery was noted. The bowel that was trapped under the adhesion was released with sharp adhesionolysis. The device was identified in the proximal vicinity and an enterotomy was made. A Lap sac was introduced and the device was retrieved. The enterotomy was closed in 2 layers with laparoscopic suturing. Patient was discharged on POD 3 and is currently doing well on iron supplements. Technological advances lead to implementation and widespread use of new devices. Complications are often not apparent immediately. Awareness and the ability to deal with complications with minimal side effects will ensure their continued use. Laparotomy is viewed as a morbid procedure to retrieve a capsule. Laparoscopy on the other hand offers a minimally invasive approach with smaller incisions, less pain, quicker recovery in the short term, and less risk of adhesions and hernia in the long term. Small bowel is a difficult area to study due to access. Capsule endoscopy had recently emerged as a novel technique to study small bowel pathology. Laparoscopy can be viewed as an emerging technology, as its indications are ever expanding and it is used in various novel procedures. 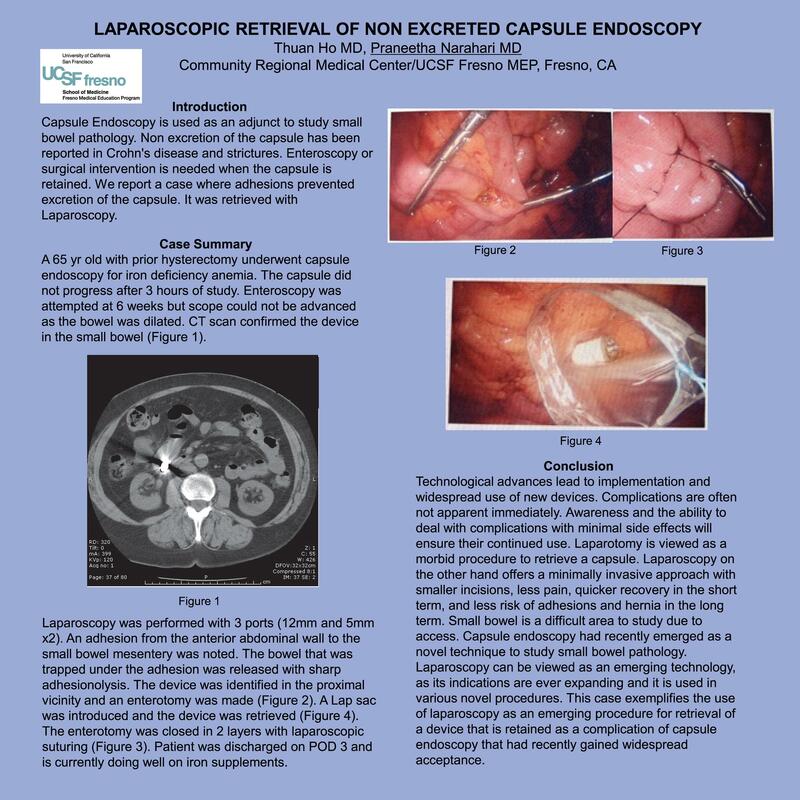 This case exemplifies the use of laparoscopy as an emerging procedure for retrieval of a device that is retained as a complication of capsule endoscopy that had recently gained widespread acceptance.